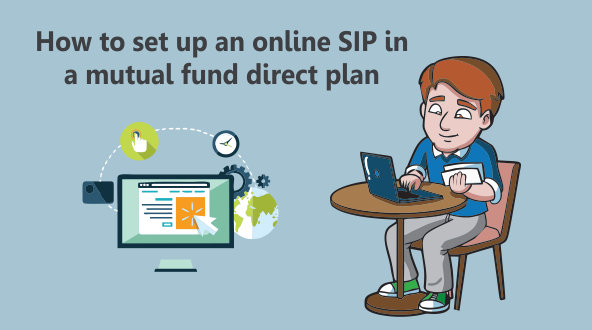 Here is how you can set up an online SIP in a mutual fund direct plan. Mutual funds have two types of plans – regular plans and direct plans. You can invest in a mutual fund regular plan through an agent, broker or distributor. The mutual fund will pay a commission to the agent, broker or distributor for providing this service. A mutual fund direct plan has a lower expense ratio because no commission is paid to an agent, broker or distributor. Are mutual fund direct plans the right option for me? Another option is to invest in mutual fund direct plans and get financial advice from a SEBI-registered fee-only financial adviser. Fee-only advisers can only be paid by their clients for the advice they provide. This ensures that there is no conflict of interest and the adviser will protect the interests of the investor. There is a new and smarter way of investing that allows you to get both robo advice and human advice while investing in direct plans. You can get all this and more at MyMoneySage.in. My Money Sage is India’s first hybrid investment platform which uses cutting-edge technology with a human touch. Powerful financial tools are used to analyze financial data and a human adviser provides hand-holding and a nudge if necessary. Pure robo-advisory platforms lack human interaction and are unable to forecast economic changes. In comparison, My Money Sage helps you to make prudent financial decisions so you can create and preserve wealth over time. Visit the office of a mutual fund and fill out a physical form. Write ‘direct’ on top and select the direct plan. Invest online through the mutual fund’s website. Invest online through the websites of the mutual fund’s registrar and transfer agent. Invest online through the MF Utilities platform. Invest online in direct plans through MyMoneySage.in with ZERO commission and fees. My Money Sage is a one-stop solution for all your financial planning and investment needs. MyMoneysage is linked to MF utilities and offers a host of features both for DIY investor as well as an investor who is seeking help from Investment advisors. A completely transparent, ZERO-commission platform with no conflicts of interest. Get unbiased advice from Registered Investment Advisors (RIAs). Use the budget feature to ensure that your expenses remain within budgeted limits. Collate all your assets across direct equity, mutual funds, EPF, PPF, NPS, small savings, insurance, gold, real estate, etc. Switch your existing mutual fund regular plans to direct plans with the click of a button. Set and track financial goals and measure your progress. Personal finance calendar will help you to keep track of due dates of premiums, credit card payments, SIPs, the maturity of deposits and more. Get a graphical representation of your asset allocation and net worth instantly. Automatically generated P&L, capital gains, net worth reports in Excel or PDF format. Your free-for-life My Money Sage account allows you to invest in mutual fund direct plans without any commission or fees. If you get stuck at any point, Registered Investment Advisors(RIAs) are standing by to help you. There are no strings attached at all, so why not try it now for FREE. Visit MyMoneySage.in, pick a membership plan that suits you and sign up. Fill out the form and click on Submit. Your data is safe because Mymoneysage employs bank-level security. Click on the Invest tab and select MF Invest from the drop-down menu. In the MF Invest window, click on ‘Go to eCAN, this facility allows investors to submit data for opening a Common Account Number (CAN) by electronic means. Fill out the application form which is divided into 4 sections: Account Type, Sole / Primary Holder, Bank Accounts and Nominees. After completing the form, click on Save or Save & Submit. Upon receiving your form, MFU will assign a primary CAN. You will receive a link by e-mail, which can be used to upload your documents. After verifying the authenticity of your documents, MFU will assign a permanent CAN to you. You can start investing in mutual fund direct plans after you receive your permanent CAN. PayEezz provides a standing instruction to your banker authorizing MF Utility to debit your account for any future mutual fund subscription transactions (Lump sum or SIP). Once you register under PayEezz, you need not issue a cheque or other payment instruction every time you invest through MF Utility up to the amount mentioned in the PayEezz mandate. You can start using the ePayEezz facility to transact as soon as you receive the PayEezz Reference Number (PRN). You can raise a ticket or contact support if you need any assistance at any stage of your investing journey. Experienced Registered Investment Advisors (RIAs) on Mymoneysage are standing by to help you. To open a free Mymoneysage account and to invest online in direct plans or to switch your existing Mutual Funds to direct click here. Mutual Funds are indeed a very effective investment tool that you can use for wealth creation. It’s critical that you choose a direct plan over the regular plan as direct plans can give you higher ROI. To invest in direct mutual funds without any cost, signup for Mymoneysage.